In this chapter I argue that the realist genres of drawing and painting used in the Chinese art school entrance examinations, which are reproduced on a massive scale in art test prep schools, constitute a new socialist realism. These forms of realism the anchoring genre of a “vision” of the characterological role “the worker” shared with both contemporary official and independent visual cultures, including the New Realism of artists like Liu Xiaodong and Sixth Generation filmmakers like Jia Zhangke. 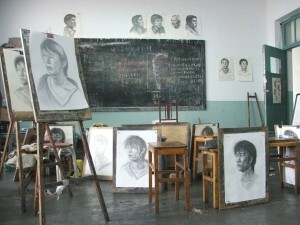 In this chapter I examine how this vision has been shaped by changing ideologies of realism, chronotopes of history and politics of class, arguing that these images of laboring people participate in a form of class “recognition” (Povinelli 2002) that offers a key to understanding what is “socialist” about postsocialist China.